When you hear the term budget beauty, is there a particular brand that comes to mind? One of the first that pops in my head is of course, e.l.f. Cosmetics. Sine day one, they’ve been the brand I turn to when I need a cheap beauty fix. Over the years, their quality and aesthetic has leveled up, all while keeping their products affordable and accessible. Some may raise an eyebrow at their prices, questioning how good a $1, $3, or $5 product can really be. 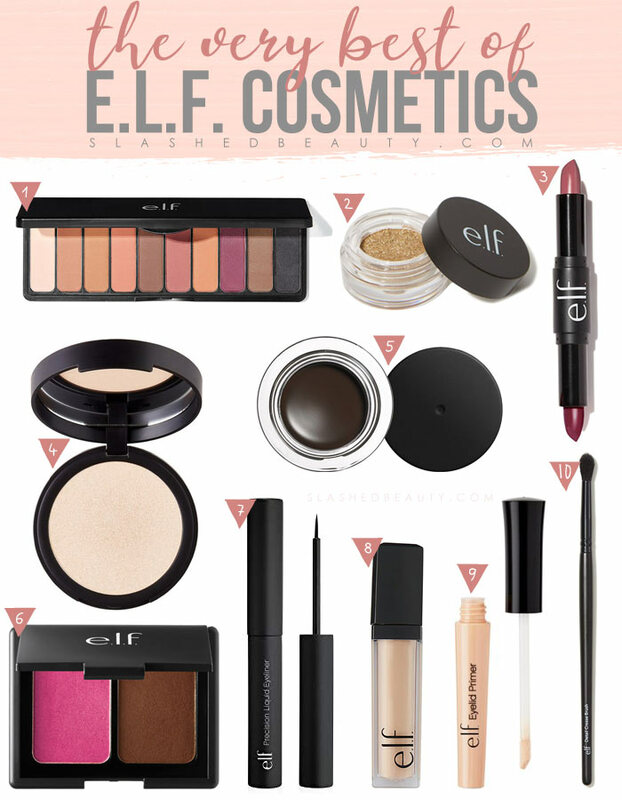 So I’m here to share with you my favorite products from the brand, what I consider to be the best makeup from e.l.f. Cosmetics. Keep reading to discover the best of e.l.f. Cosmetics as far as makeup goes (plus one tool!). Let me know if you want a separate roundup for their skin care— that’s a whole other animal! Click the photo of the product to find it online. The Mad for Matte eyeshadow palettes have been some of my favorite releases over the past year. I’m a sucker for good matte shadows that are pigmented, smooth and easy to blend— and these check each box! I’m a particular fan of the Summer Breeze palette, which features peach-leaning neutrals with a pop of magenta and a rich black. See my review and swatches here. I’m a big fan of cream shadows that I can use as all-over lid shades, and the Long Lasting Lustrous Eyeshadow is one of my favorite products to use for just that! They have a whipped texture that glides onto the eye and blends out for a soft effect. They’re full of shimmer can be used on the lid or as liner. Once they set, the color lasts all day. These are my favorite lipsticks to travel with, and my favorite lipsticks from the brand. The Day to Night Lipstick Duos are double ended and contain two shades each that compliment each other— one “day” shade that’s a little more subtle, and a “night” shade to turn up the drama. The creamy and intensely pigmented formula makes them more than a novelty, but a truly gorgeous product to wear. See my review and swatches of all four lipsticks here. It’s hard to find powder highlighter that I love these days, especially at drugstore prices. The Shimmer Highlighting Powder is hands down my absolute favorite, because you get the effect of a dewy sheen but in a powder formula! The shimmer is tightly packed as you swipe it onto your skin, so you get more of a glow rather than a bunch of glitter. See my review and see swatches here. Ya’ll know I love the full-brow look, and the Lock On Liner and Brow Cream is one of my faves to help me achieve a sharp and defined eyebrow. Of course, it can also be used as a cream liner, but I only ever use it on the brows. The pomade is pigmented and really easy to work with, and I haven’t found it to dry out terribly over time. Plus, it lasts throughout the day without major fading even after 8 hours. See swatches and how I use it in my routine here. This product is the re-vamped version of the original Blush & Bronzer duo, but with a twist. The Aqua Beauty Blush & Bronzer is a cream-to-powder formula that’s infused with Vitamin E and purified water for a smooth finish that hydrates your skin. I think it blends out better than the powder version, and there are more color options for medium/deep skin tones. I’m a big fan of liners that have a thin brush tip applicator. I feel like it gives me the most control, especially when doing my signature cat eye. The Precision Liquid Liner goes on deep black and the precision tip creates sharp, defined lines. I love it so much that it made my list of the best drugstore liquid liners! For the under-eye area, I like using thin concealers that offer comfortable coverage— and the HD Lifting Concealer fits the bill. It brightens up dark circles and I’ve also used it to cover up blemishes. It made the cut for the best drugstore concealers list! You have probably seen me use this primer a million times on my YouTube channel, ever since the beginning. And that’s because it just downright works! It extends the life of my eye shadow so that it lasts all day without creasing. For $2, there’s literally no reason to pay any more! e.l.f. has some great tools that make for a perfect brush collection for beginners, but this one is the brush I use the most. The Detail Crease Brush is a small tapered blending brush that comes in handy for all sorts of purposes. Mostly, I use it to blend and deepen shadows in my outer corner and crease for a diffused look. I also like using this for under-eye shadow blending because of its size. However, it also comes in handy if you want to spot-powder on blemishes you’ve covered with concealer. Do you have any all time favorites from e.l.f. Cosmetics? I think their brushes are really good. I have so many favorites from them: Flawless Finish Foundation, HD Powder, Mist & Set, Mad for Mattes Palette, Moisturizing Lipsticks, Matte Lip Colors, Baked Highlighters, and Glitter Primer.